Mikura is on the rise again. Tokyo: a city populated by both humans and ghostly beings. They exist in both dimensions, seen and unseen: spirits, apparitions, demons. The balance between these two dimensions has been upheld by the city's guardian crow Karas and his masters. But that balance has been thrown into disarray as Eko, a former Karas, has attempted to seize power and bring order to the streets through force. The entity Yurine, who represents the will of the people, stands in his way with her newly risen Karas. Now an ageless battle stretching across both dimensions and killing humans and spirits alike is in progress. Karas is humanity's last hope. 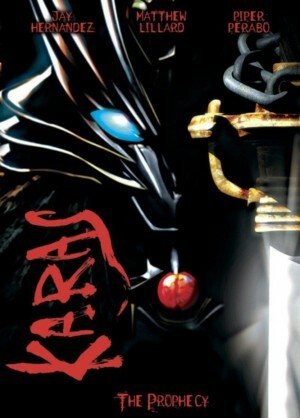 Prolific Japanese animation producers Tatsunoko Productions breathe life into Karas, their 40th anniversary animation production and one of Anime Insider's top five anticipated anime releases in America for 2006. Featuring brilliant designs, stunning 2D/3D hybrid animation, breathtaking fight sequences, a thrilling musical score from the Prague Symphony Orchestra in 6.1 channel sound and starring the voices of Jay Hernandez, Matthew Lillard and Piper Perabo, Karas will leave you breathless at the edge of your seat.